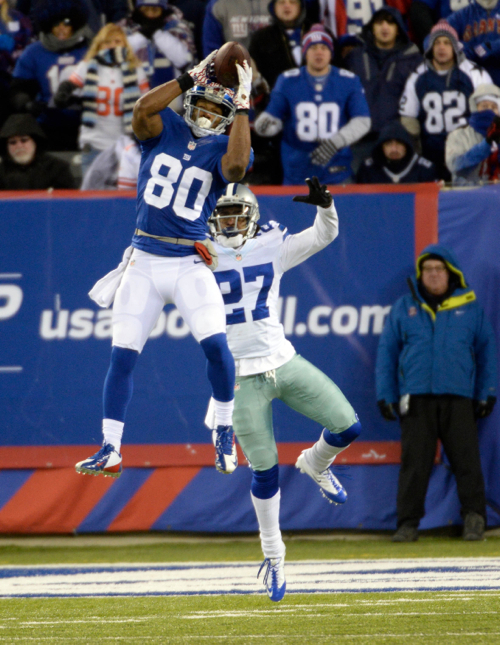 Multiple media outlets are reporting that New York Giants wide receiver Victor Cruz has agreed to a re-structured contract. Cruz has three years left on his current contract and was scheduled to make $7.9 million in base salary in 2016 and count $9.9 million against the 2016 salary cap. The Bergen Record is reporting that Cruz’s 2016 base salary will drop from $7.9 million to $1.3 million. The paper says playing-time incentives of up to $5.5 million plus production incentives could recoup the full value of the original $7.9 million. The NFL Network is reporting that the re-structured deal does not impact his original numbers in 2017 ($7.4 million salary) and 2018 ($8.4 million salary). The New York Giants had reportedly expressed interest in unrestricted free agent defensive end Derrick Shelby (Miami Dolphins), but he has signed with the Atlanta Falcons. The New York Giants had reportedly expressed interest in unrestricted free agent defensive end Adrian Clayborn (Atlanta Falcons), but he has re-signed with the Falcons. Richest contracts in 2016 free agency: JAX DT Jackson ($90 million), NYG DE Vernon (85M), HOU QB Osweiler (72M), NYG CB Jenkins (62.5M). New NYG Olivier Vernon was an elite pass rusher in 2nd half of 2015 season. From Weeks 9-17, he had 29 QB Hits — most in the NFL. The NFL Network is reporting that the New York Giants have re-signed unrestricted free agent defensive end Jason Pierre-Paul to a 1-year contract. The NFL Network says Pierre-Paul turned down more money from other teams to remain with the Giants. ESPN.com reports that the contract could be worth “up to” $10.5 million and that the Arizona Cardinals made a strong effort to sign Pierre-Paul. The New York Daily News speculates that the contract will be laden with incentives such as sacks and playing time. Pierre-Paul suffered serious and permanent injuries to his right hand from a July 4th fireworks accident, including the amputation of his index finger and severe damage to his thumb and middle finger. He returned to the playing field halfway through the 2015 season, wearing a large club that made it impossible for him to grab and tackle with his right hand. Pierre-Paul started the eight games he played in and finished the season with 26 tackles, 1 sack, and 6 pass defenses. Pierre-Paul had additional offseason surgery in an effort to improve the grip on his damaged hand and hopefully allow him to play without a club. FOXSports.com is reporting that the New York Jets have expressed interest in New York Giants unrestricted free agent cornerback Prince Amukamara. ESPN is reporting that free agent defensive end Charles Johnson, who met with the New York Giants on Sunday and Monday, left without a contract and met with the Tampa Bay Buccaneers on Monday. NJ.com is reporting that despite reports of mutual interest and a possible visit, free agent defensive end Mario Williams is “not in play for the Giants at this time.” According to multiple reports, Williams is close to signing with the Miami Dolphins. ESPN is reporting that the New York Giants are “weighing the idea” of making a contract offer to transition-tagged free agent Olivier Vernon (Miami Dolphins). ESPN is reporting that the New York Giants have expressed interest in the following unrestricted free agents: defensive end Williams Hayes (Los Angeles Rams), defensive end Derrick Shelby (Miami Dolphins), defensive end Adrian Clayborn (Atlanta Falcons), cornerback Patrick Robinson (San Diego Chargers), and safety Rodney McCloud (Los Angeles Rams). 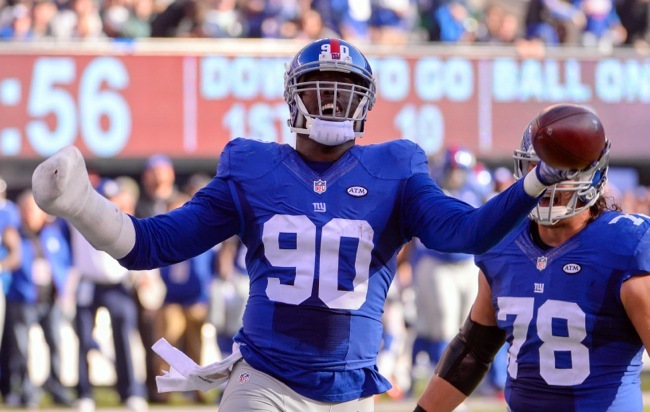 The #Giants are nowhere near done on the defensive line. Expect several more big moves. ESPN is reporting that free agent defensive end Charles Johnson, who was recently cut by the Carolina Panthers in a salary cap-related move, met with the New York Giants on Sunday and Monday. If the Giants and Johnson do not agree on a contract, he is reportedly scheduled to meet with the Tampa Bay Buccaneers next. From 2010-2014, Johnson averaged 43 tackles and 10.5 sacks per year. Those numbers plummeted in 2015 when Johnson missed seven regular-season games with a hamstring injury and finished the year with 12 tackles and one sack. He had an excellent game in the Super Bowl with five tackles, one sack, and a forced fumble. Overall, Johnson accrued nine tackles, three sacks, and two forced fumbles in three post-season games last season. Following up on yesterday’s update, there is no new information on free agent defensive end Mario Williams visiting the Giants. BleacherReport.com is reporting that the Giants, Dolphins, and Jaguars are interested in Williams, who supposedly is seeking a $10 million-per-year contract. The 31-year old Williams was recently released by the Bills. Miscast in a 3-4 defense, Williams started 15 games for the Bills in 2015 and finished the season with just 19 tackles and five sacks. From 2012-2014, Williams averaged 34 tackles and 13 sacks per season. He is a four-time Pro Bowler (2008, 2009, 2013, 2014) and was first-team All Pro in 2014. The New York Daily News is reporting that the New York Giants are interested in Atlanta Falcons unrestricted free agent defensive end Adrian Clayborn. Several other teams are also said to be interested in Clayborn, who was originally drafted in the 1st round of the 2011 NFL Draft. He missed most of the 2012 season with a knee injury and most of the 2014 season with a biceps injury. The Falcons signed Clayborn as a free agent in 2015. Last season, he played in all 16 regular-season games with four starts, finishing the year with 15 tackles and three sacks. 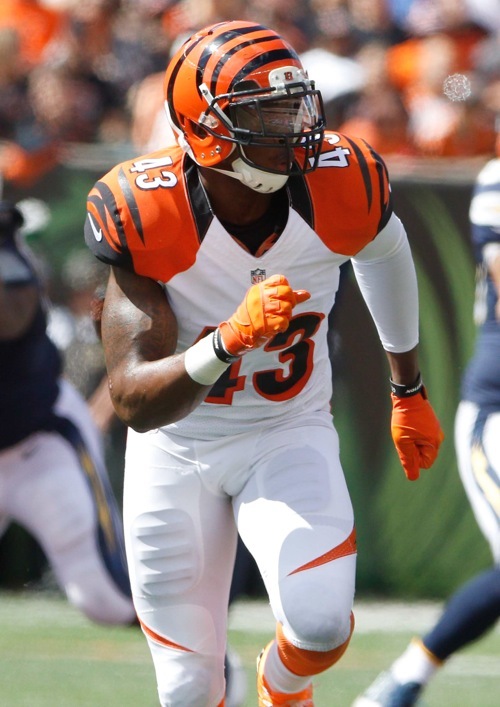 The Cincinnati Enquirer is reporting that the New York Giants are one of several teams interested in Cincinnati Bengals unrestricted free agent safety George Iloka. The 25-year old Iloka was originally drafted in the 5th round of the 2012 NFL Draft. He has started all 44 regular-season games he played in the last three seasons, including 12 games in 2015 where he accrued 47 tackles and one interception. The Cleveland Plains Dealer is reporting that the New York Giants have expressed interest in Cleveland Browns unrestricted free agent Mitchell Schwartz, the brother of recently-waived guard Geoff Schwartz. The 26-year old Schwartz was originally drafted in the 2nd round of the 2012 NFL Draft by the Browns. He has started every game during his first four years in the NFL. The St. Paul Pioneer Press is reporting that the New York Giants have expressed interest in Minnesota Vikings unrestricted free agent offensive guard Mike Harris. The 27-year old Harris was originally signed as an undrafted rookie free agent by the San Diego Chargers after the 2012 NFL Draft. He started all 16 regular-season games for the Vikings in 2015. A media report out of Arizona says the Cardinals are interested in signing New York Giants unrestricted free agent defensive end Jason Pierre-Paul. BleacherReport.com is reporting that New York Giants unrestricted free agent defensive end Robert Ayers is seeking a $10 million-per-year contract. ESPN.com is reporting that the New York Giants had discussions last week with the representatives for wide receiver Victor Cruz about restructuring his contract. Cruz is currently set to count $9.9 million against the team’s 2016 NFL cap, the second most by a player after quarterback Eli Manning. 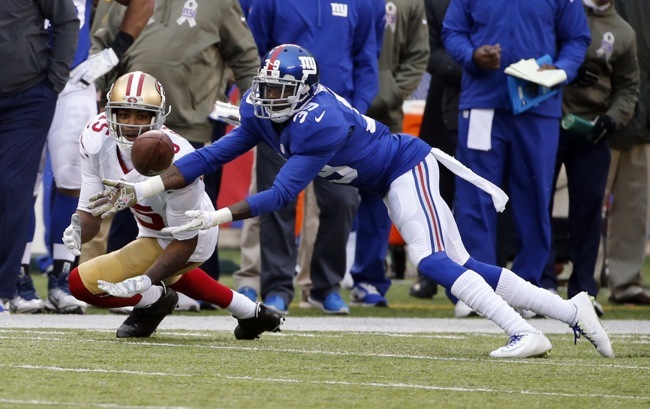 It has been speculated that if Cruz does not accept a pay cut, he may be released from the Giants. Cruz recently said that he believed there was an “80 percent” chance he would return to Giants. According to The New York Daily News, the New York Giants have expressed interest in unrestricted free agents safety Ron Parker (Kansas City Chiefs) and defensive end Adrian Clayborn (Tampa Bay Buccaneers). USA Today is also reporting the Giants interest in Clayborn. While teams are not allowed to officially sign players from other teams until 4:00PM ET on March 10, they can negotiate with them as of March 7. 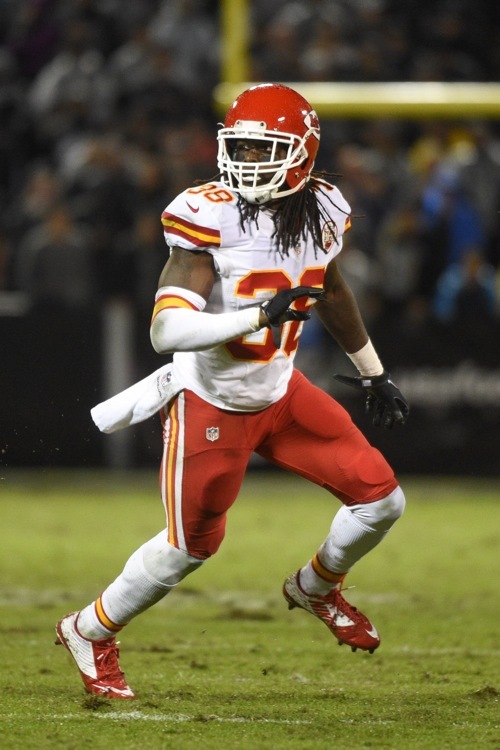 The 27-year old Parker started 15 games for the Chiefs in 2014, finishing with 94 tackles, 1 sack, 12 pass defenses, 1 interception, and 1 forced fumble. Parker, who has experience playing corner, combines better-than-average coverage skills for a 6′, 206lb safety. The 26-year old Clayborn, who was drafted in the 1st round of the 2011 NFL Draft by Tampa Bay, has never lived up to his draft-day expectations. He missed most of 2012 and 2014 with injuries, but did accrue 13 sacks in the two years he was healthy (2011 and 2013). The New York Daily News is also reporting that the Giants are trying to re-sign unrestricted free agent Stevie Brown. In the “less official” category, TheHuddleReport.com is reporting that the Giants may be interested in unrestricted free agent linebacker Brooks Reed (Houston Texans). The 28-year old Reed started 13 games in 2014 and finished with 41 tackles, 3 sacks, and 1 interception. Rumors persist that the Giants are interested in unrestricted free agent Devin McCourty (New England Patriots), who is widely considered the best safety on the market. There has also been some internet buzz that the Giants are interested in unrestricted free agent defensive end Brandon Graham (Philadelphia Eagles).